Celebrating the birthday of Charles Perrault by recording 159,000 hits! 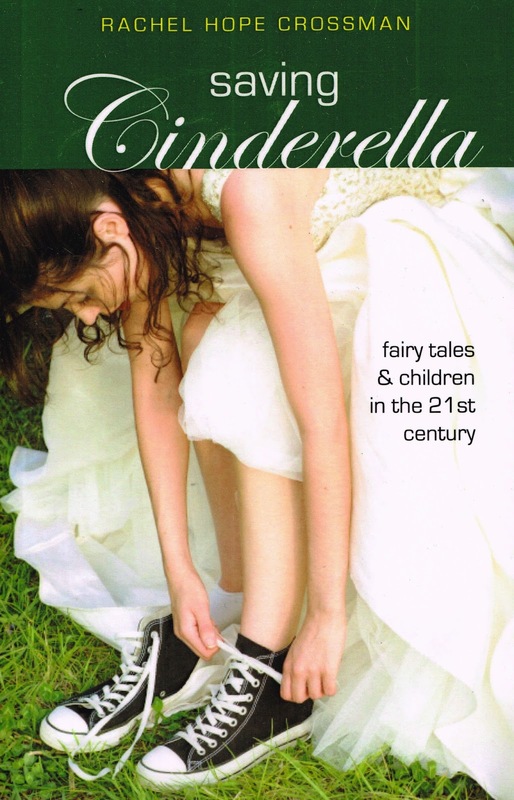 Once upon a time, long ago in France, there lived a melancholy girl who was called Cinderella. Her father "was a gentleman who was a widower." Some time after Cinderella's mother died, he took a second wife. She was "a very proud, disagreeable woman" and she had two daughters of her own, a pair of "haughty, overbearing, and thoroughly unpleasant" young ladies. By contrast, the gentleman's own daughter was "was a young girl of wonderful sweetness and good temper. In this, she was like her mother, who had been the finest mother in the world." For a brief time after the wedding, Cinderella was treated with some respect. Before long, however, she was doing "all the meanest household chores to do, from scouring the dishes to scrubbing the stairs to cleaning out the rooms of her" stepsisters. At day's end, poor Cinderella had only "a thin, straw mattress in a tiny room at the top of the house." She dared not complain to her father, who seemed to take no notice of her condition. She shivered in the cold, and took to sitting "quietly near the fire, paying no heed to the cinders and ashes that drifted lazily around her." For this,. they called her Cinderbritches, until the younger stepsister, "who was not quite as rude as the other, called her Cinderella". It happened one day that the King's son invited "everyone of rank and nobility in the land." You may imagine how pleased the stepsisters were to find themselves on the select list. "I,' said the elder,'shall wear my red velvet dress with the English lace.' 'I,' said the younger,' shall wear my gold-flowered cloak and my diamond necklace." All stylish ladies at that time stuck tiny shapes to their faces to enhance their beauty; these two spent many days in front of the looking glass experimenting with their appearance. "Meanwhile, Cinderella was kept busier than ever ironing her stepsisters' ruffles." On the night of the ball, as she was dressing their hair, the young sister asked, "Do you not wish you were going to the ball?' 'Ah,' replied Cinderella,'now you are mocking me. I would be out of place at such a grand event.' 'For once, you are right, 'said the older sister, 'people would find it very funny indeed to see a Cinderbritches at the ball." Most people would have been tempted to pull the hair of one who spoke to them so, but not Cinderella. So gentle was her nature. When finally they departed, the ragged young girl sat down amongst the ashes. Alone, she began to cry. That's when she heard a voice! 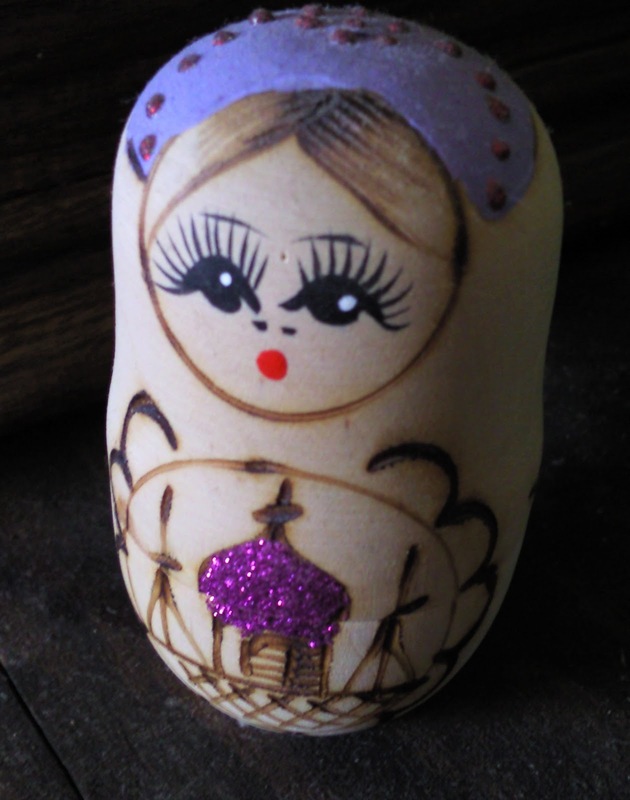 "Her fairy godmother, who had been watching over her,appeared and asked what was the matter." But Cinderella could not get the words out, so heavily did her tears flow. Yet her godmother seemed to know. "You wish to go to the ball, do you not?" And when she heard Cinderella sigh, she knew that this was her wish. "You have been a good girl,' said her godmother. 'I shall see that you go." Now the fairy bade her go to the garden and bring a pumpkin. Cinderella "found the largest pumpkin in the garden and carried back to her godmother, who hollowed it out so only the rind was left. Then she struck it with her wand, and the pumpkin was transformed into a gilded coach." But who would draw it? Six little mice from the trap filled the need. "As each mouse scurried out, the godmother tapped it with her wand. Instantly the mice changed into horses — beautiful gray ones that all matched perfectly." For a coachman, the fairy godmother decided on a rat. She chose from the three that were in the trap "the one with the longest whiskers and tapped it with her wand. Instantly, it became a plump coachman, with a very impressive mustache." With the six lizards that were behind the watering pot, the old woman created "six footmen dressed in embroidered livery. They leaped onto the coach so nimbly that it looked as if they had done nothing else all their lives." Yet when the fairy asked if Cinderella were not pleased, the girl said," Oh,yes. But must I go as I am, in these wretched rags?' Her godmother simply touched her with the wand, and Cinderella's rags turned into a gown of gold and silver that sparkled with jewels. A pair of high-heeled slippers appeared on her feet. They were made of glass, and were so lovely that Cinderella exclaimed with pleasure when she saw them." Just as the carriage was about to whisk her away, her godmother warned her not to stay so much as one minute past the stroke of twelve. "If you stay a moment longer, your coach will turn back into a pumpkin, your horses to mice, your coachman to a rat, your footmen to lizards, and your gown to rags." She promised, and was off to the ball. Such an entrance made Cinderella that "the violins stopped playing and the dancing came to a halt." Even the king, "old as he was" found himself drawn to the mysterious young princess. All the ladies meanwhile, "were busily inspecting Cinderella's headdress and gown in hopes of having similar ones made as soon as possible." And the prince would not leave her side. All night they danced, and he saw that she was so graceful that she seemed to be enchanted. When the clock "struck a quarter to midnight, Cinderella quickly made a deep curtsy to the guests and hurried off." Arriving home minutes before her sister, she thanked the fairy and begged for permission to go the following night. 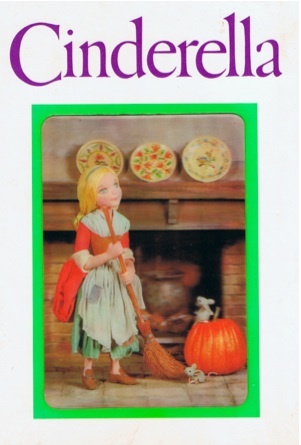 It was given, and now Cinderella settled down before the fire. As her stepsisters came in, gossiping and laughing, they bubbled over with stories of the princess who had shared lemons and oranges with them. "Absolutely no one knew" her name, they said, and "the king's son in particular would give the world to find out." Cinderella smiled to herself. But the next night, so deeply was she engaged in conversation and dancing with the prince that she forgot the time. "She sprang up and ran out of the ballroom as swiftly as a frightened deer." 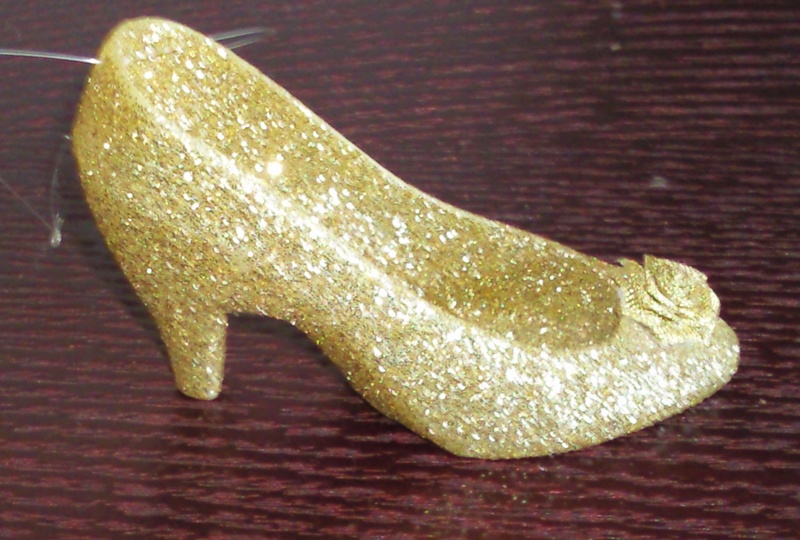 When the prince followed, and found her shoe, he could not believe that she had departed without a trace. He questioned the guards about which princesses they had seen leave the palace, but they answered that only "a young girl in rags who looked more like a peasant than a lady" had passed through the gates. At home, Cinderella discovered that she was still wearing one glass shoe. This night when her stepsisters came in, they talked of nothing but the prince's discovery of a glass slipper, and rumors of a search to find the one who had lost it. This forecast proved correct, for "a few days later, the king's son proclaimed that he would marry" she who could wear this slipper. "Princesses, duchesses, court ladies, and all manner of highborn women tried to put tghe slipper on, but in vain." 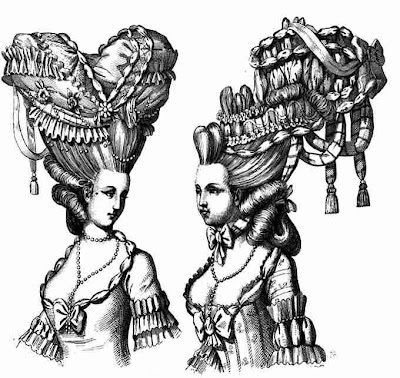 When at last the turn came for the stepsisters to try it, no amount of squeezing allowed them to wear it. Then Cinderella said, "Let me try it on.' Her sisters burst into mocking laughter. But the court envoy who was fitting the slipper thought it only fair that Cinderella try it on — the king's son had decreed that all young women could." When she sat down and slipped her foot right into the shoe, "her sisters were overcome with surprise." And then they were "thunderstruck when she produced the other slipper from her pocket." And now the fairy godmother arrived again, and tapped her goddaughter lightly, and "the girl's sooty rags were transformed onto a gown of silk, lace, and pearls." Her stepsisters, suddenly recognizing the princess who had shared her fruit, begged most humbly to be forgiven for their previous behavior. Cinderella, "whose goodness knew no bounds", forgave them graciously. Then "the envoy escorted her to the palace, where the king's son awaited her. He found her more beautiful than ever, and in a few days, they were married." MORAL: Woman's beauty is a treasure we never tire of admiring. But good grace is far more precious, and forgiveness a jewel beyond price. But with it, anything is possible. 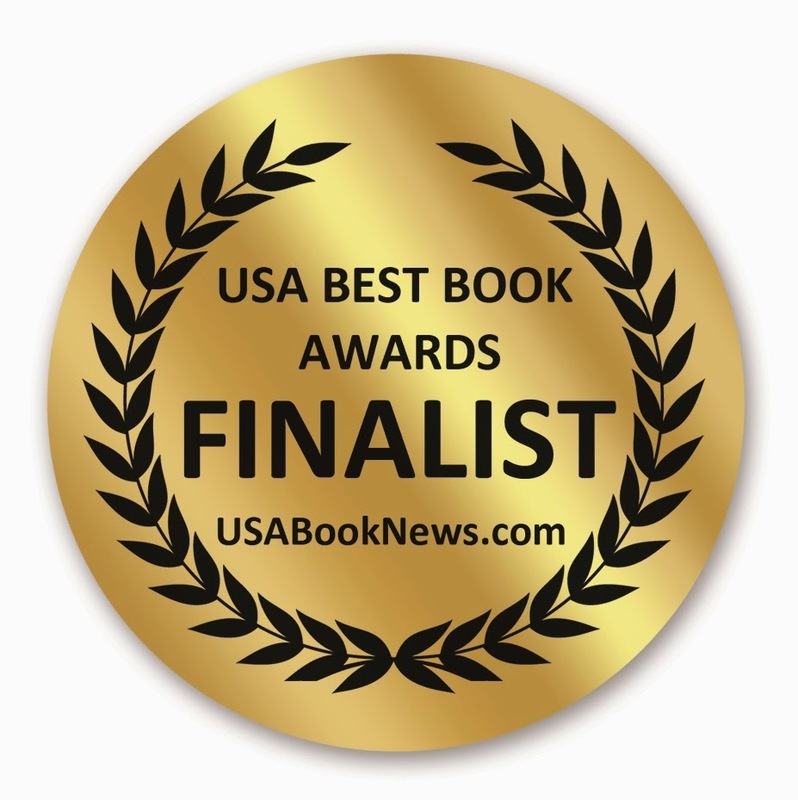 My book, SAVING CINDERELLA: FAIRY TALES AND CHILDREN IN THE 21ST CENTURY, has been named finalist in the USA Best Book Awards, in the Children's Educational Category. University Press Books, 2430 Bancroft Way, Berkeley CA 94704 510-548-0585. Get it locally from UPB! We have lift off! As of today, November 24, 2014 this blog has had 100, 082 views. Thank you again to all, and please continue sharing this site with all of those interested in Cinderella. 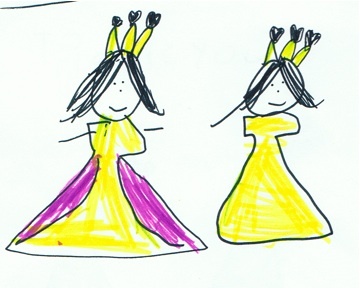 Two princesses, by the other Emily! Good morning everyone and thank you for viewing my blog. As of today, November 24, 2014 it has received 99, 988 hits!